1 After a clear night, freezing fog came along from 0400 on, before Tmin in garden was reached: -4,2°C. Fog lasted till 1330, from then on clearing skies with Cirrus remaining. The freezing fog returned from 2130 on. Top Tmax: Elsenborn 11,3°C (had also top Tmin in morning: -7,8°C), Zaventem had 1,3°C, just like in my garden. Northern & western parts of Flanders remained in the fog with subzero's of around -1°C. Top snow cover: Mont Rigi & Elsenborn still 4 cm thanks to the very low dewpoints. 2 Gardens Tmin -4,2°C. All day long Stratus overcast with freezing fog till noon, sometimes slight snow grains fell as well. In afternoon tempo turning misty. Top Tmax: Elsenborn 6,4°C, Zaventem had -2,2°C, in my garden -1,7°C. All lower parts of Belgium except coastal area remained subzero. A small coat of dust snow was observed near power plants & cities. Top snow cover: Elsenborn & Mont Rigi 3 cm. 3 Gardens Tmin -3,9°C. All day long Stratus lifting to Sc and misty with sometimes some slight snow grains (in morning even "diamond dust"). Top Tmin: Elsenborn -13,3°C, St-Hubert -9,0°C, Spa -8,8°C. Top Tmax: Ostend 2,1°C, Zaventem had -1,1°C, in my garden reaching slightly positive values from 2200 on. Top snow cover: Elsenborn & Mont Rigi 3 cm. 4 No night frost and whole day long St Sc grey with sometimes drizzle. A few gaps in clouds around 0900 & 1600. Top Tmax: Brasschaat 7,0°C, Zaventem had 3,6°C, in my garden 4,6°C. Top snow cover: Elsenborn & Mont Rigi 3 cm. 5 All day long Stratus overcast and misty. From 1000 on drizzle, from 1500 on fog. Top Tmax: Ghent 6,4°C, Zaventem had 5,1 and in my garden reaching 5,5°C after 1900. Top snow cover: Elsenborn & Mont Rigi 3 cm. 6 Fog lifted from 0200 on but remaining misty till 0800. Very cloudy with Stratus & Sc, a couple of times some slight drizzle. Top Tmax: Ghent, Semmerzake, Deurne & Ostend 6,0°C. Zaventem had 5,5°C, in my garden 6,3C. Top snow cover: Elsenborn & Mont Rigi 3 cm. 7 All day long very cloudy with Sc, in morning some slight rain too. Top Tmax: Ghent 8,9°C, Zaventem had 7,9°C, in my garden 8,8°C. Top snow cover: Elsenborn & Mont Rigi 2 cm. 8 Rain on ana cold front, moderate at times from 0100 till 0700 giving 11 mm. Cloudy to very Cu Sc cloudy with a few light rain showers between 1100-1300 and a light rain & soft hail shower around 1700. Top Tmax: Koksijde 7,7°C, Zaventem had 6,4°C, in my garden 7,3°C. Top snow cover: Elsenborn 3 cm, St-Hubert 2 cm, Spa 1 cm. 9 Cloudy with tempo some rain & sleet showers, in morning & forenoon also a few "graupel showers", but no significant cover with Tmin of 1,2°C. 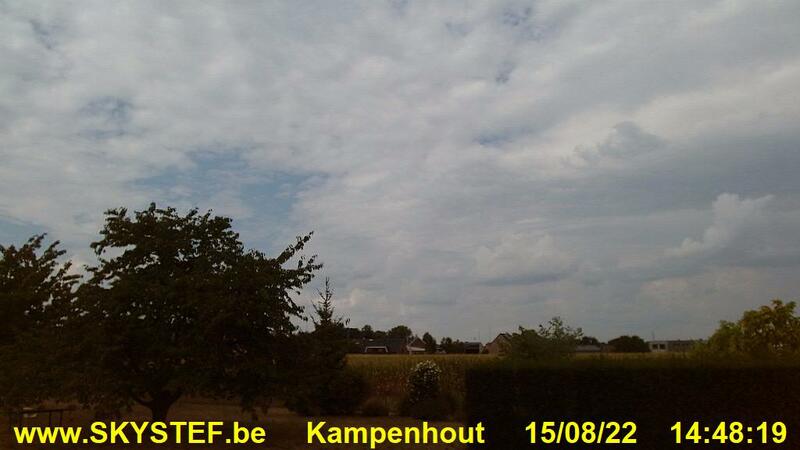 In Belgium locally some weak thunderstorms. Top Tmax: Koksijde 5,1°C, Zaventem had 4,2°C, in my garden 4,1°C. Top snow cover: Mont Rigi 19 cm, Elsenborn 12 cm, St-Hubert & Spa 6 cm. Some parts in Flanders had in morning a cover of about 1 cm. 10 Tmin 0,4°C. Cloudy with tempo a few rain & graupel showers. Top Tmax: Semmerzake 6,7°C, Zaventem had 5,7°C, in my garden 5,6°C. Top snow cover: Mont Rigi 23 cm, Elsenborn 18 cm, St-Hubert 9 cm & Spa 7 cm. 11 Cloudy to very cloudy with Sc. Top Tmax: Ostend 7,1°C, in my garden 5,3°C. Top snow cover: Mont Rigi 21 cm, Elsenborn 18 cm, St-Hubert 9 cm & Spa 7 cm. 12 Tmin in garden reached -1,8°C. In forenoon increasing medium level clouds, first light wet snow of approaching warm front started to fall from 1300 on. Continuous light snow till 2230 with temperatures just above freezing: snow cover reached 4 cm. Afterwards tempo some sleet & light rain. Top Tmax: Retie & Diepenbeek 4,1°C. Zaventem had 3,6°C, in my garden 4,0°C. Top snow cover: Mont Rigi 22 cm, Elsenborn 14 cm, St-Hubert 9 cm & Spa 7 cm. In the evening Florennes 7 cm, Ukkel & Brasschaat 5 cm, Deurne & Charleroi 4 cm, Zaventem 3 cm, Kleine Brogel & Beauvechain 2 cm. 13 Overcast with Sc, no frost and 2 cm of snow remaining in morning which disappeared gradually during the day. From 1500 on light to moderate drizzle on warm front. Top Tmax: Koksijde 7,9°C, Zaventem had 3,4°C, in my garden 4,1°C. Top snow cover: Mont Rigi 23 cm, Elsenborn 15 cm, St-Hubert 11 cm & Spa 8 cm. 14 Drizzle till 0300 afterwards very cloudy, in afternoon tempo some larger breaks with Ci Cs remaining. Between 1600-1900 passage of weak cold front with some slight rain & drizzle, decreasing Sc Ac cloudiness afterwards. Top Tmax: Brasschaat & Kleine Brogel 9,4°C, Zaventem had 8,0°C, in my garden 8,9°C. Top snow cover: Mont Rigi 22 cm, Elsenborn 15 cm, St-Hubert 10 cm & Spa 7 cm. 15 Rain between 0500-1230 with 17 mm collected. Becoming cloudy with Cu Sc, towards sunset with increasing Ac Ci. In the evening some weak thunderstorms over provinces of Namur and Liège. Top Tmax: Ostend 11,6°C, Zaventem had 10,5°C, in my garden 11,6°C. Top snow cover: Mont Rigi 19 cm, Elsenborn 11 cm, St-Hubert 9 cm & Spa 3 cm. 16 Variable Cu Sc TCu & Cb cloudiness with tempo some light to moderate rain showers collecting 5 mm. In Belgium some weak thunderstorms were observed over provinces of West-Vlaanderen, Brabant, Hainaut, Namur and Luxembourg. Top Tmax: Diepenbeek 10,4°C, Zaventem had 9,0°C, in my garden 9,4°C. Top snow cover: Mont Rigi 13 cm, Elsenborn 2 cm. 17 Overcast Sc Ns with rain or showery rain from 0600 on giving by midnight 8 mm. Top Tmax: Ostend 8,0°C, Zaventem had 7,4°C, just like in my garden. Top snow cover: Mont Rigi 14 cm, Elsenborn 3 cm. 18 After some breaks in the night with Tmin of 1,1°C, becoming in morning overcast with As & Sc and light rain between 1100-1500 giving 2 mm. Top Tmax: Ostend 6,5°C, Zaventem had 4,9°C, in my garden 5,5°C. Top snow cover: Mont Rigi 15 cm, Elsenborn 1 cm. 19 Very cloudy with As Ac with between 1800-2200 some slight rain. Top Tmax: Kleine Brogel & Diest 9,4°C, Zaventem had 9,0°C, in my garden 9,4°C. Top snow cover: Mont Rigi 15 cm. 20 Overcast with Sc, later Ns with light rain & drizzle from 0500 on giving 16 mm by midnight. Some sleet around 1300 and from 2100 on. Top Tmax: Ostend 5,0°C, Zaventem had 3,9°C, in my garden 4,1°C. Top snow cover: Mont Rigi 14 cm, Elsenborn 2 cm. 21 Light rain & drizzle till 1100 accompanied by sleet between 0000-0600 with Tmin 1,1°C. Remaining stratus overcast with renewal of light rain drizzle between 1430-2200. Total 6 mm by midnight. Top Tmax: Ostend 4,6°C, Zaventem had 2,4°C, in my garden 2,8°C. Top snow cover: Mont Rigi 22 cm, Elsenborn 6 cm, Spa 4 cm. 22 After some slight rain between 0200-0300, all period long Sc overcast. Top Tmax: Ostend 4,5°C, Zaventem had 3,3°C, in my garden 4,1°C. Top snow cover: Mont Rigi 19 cm, Elsenborn 6 cm, Spa 2 cm. 23 Tmin reached -1,9°C, very Sc cloudy with (s)light snow between 0830-1100 giving tempo some "dust" on the ground. Afterwards a couple hours breaking Cu Sc clouds, early afternoon again very Sc cloudy. Top Tmax: Brasschaat 3,0°C, Zaventem had 1,4°C. Top snow cover: Mont Rigi 17 cm, Elsenborn 3 cm. 24 Remaining very cloudy, Sc thick enough to produce some snow flurries around 0700. Tmin garden -2,2°C. Afterwards clearing skies, but increasing Ci Cs during afternoon. Top Tmax: Kleine Brogel 6,5°C, Zaventem had 4,8°C, in my garden 5,6°C. Top snow cover: Mont Rigi 17 cm, Elsenborn 3 cm. 25 Quite sunny with besides some Ci tempo a few Cu Sc clouds. Gardens Tmin -1,6°C, Tmax 4,5°C. Top Tmax: Kleine Brogel 4,6°C, Zaventem had 2,7°C. Top snow cover: Mont Rigi 17 cm, Elsenborn 3 cm. 26 Shortly after midnight becoming very Sc cloudy with just before the Tmin reached -1,7°C. During the early afternoon tempo some slight snow grains, but soon afterwards the clouds started to break. Top Tmax: Kleine Brogel 4,9°C, Zaventem had 2,3°C, in my garden 3,4°C. Top snow cover: Mont Rigi 17 cm, Elsenborn 3 cm. 27 Tmin -2,2°C. During the night becoming very Sc cloudy but remaining dry. Around noon a slight shower of rain & soft hail, around 1430 even a moderate one with same ingredients turning the world a bit white of 10 minutes. After 2030 light rain. Top Tmax: Brasschaat 6,2°C. Zaventem had 4,4°C, in my garden 5,4°C. Top snow cover: Mont Rigi 19 cm, Elsenborn 5 cm. 28 Continues light rain turning to sleet around 0500 and snow around 0830, back to sleet and rain from 1100 till 1300. Total 10 mm. In afternoon a couple of soft hail showers, around 1500 a heavy snow shower giving briefly a wet coat of <0,5 cm. From 2000 more snow showers came in giving 1 cm by midnight. Top Tmax: Brasschaat 5,0°C, Zaventem had 4,0°C. Top snow cover: Mont Rigi 39 cm, Elsenborn 25 cm, Spa 15 cm, St-Hubert 11 cm, Florennes 8 cm.